I read the song titles and scanned the liner notes and I immediately got the impression that this music would have a strong connection to the earth. I mean the earth as a planet and as a cosmos. My theory was validated after the first two or three cuts. There is something organic in the music. It is almost palpable. 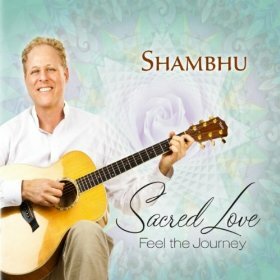 Guitarist and composer Shambhu, along with many talented musicians created a plethora of emotional and romantic songs on his album Sacred Love - Feel the Journey. After I was finished I became a believer. I did feel the journey. The music has a rare quality to it. It is virtually lighter than aire. The sound is clean and pure and it was not hard to imagine, once I read the notes that told me that Will Ackerman and his studio musicians had their hands in the project. The guitar and the violin dance an aural bossa nova in the opening number called Together. There is that sweet, sensual audible push and pull, sway and swirl and the surrender of two lovers into their own special world for just the time it takes to play the song. The music suggests that whenever they are together, they have escaped the ordinary. My vote for one of the most peaceful songs ever written goes to Edge of Eternal. The horns and voices are that of the angels and the guitar melody is celestial. After a minute into the song you feel weightless, after the end, you feel blessed. Some of the credit is due from Jill Haley's English horn and Eugene Freisen's cello. This was my absolute favorite on Sacred Love. The track Natural Momenthad a funky east tumbles into west kind of vibe. It was likeable for its lively tempo, its great mix of sitar and electric guitar and its cheeky melody. It felt like the song was improvised, reworked and improvised again. It was just the kind of tune that had endless potential. I can always tell when producer and guitar great Will Ackerman starts plucking on a tune and it was he that started the song Imagine. Ackerman has a quality that I call musical grace and it is that approbation that mixes with Shambhu's tune and makes it on the one hand, very familiar and on the other, new and exciting. Together they make the music timeless. Premik Russell Tubbs is the flute player for the ethereal tune Nirab Amare. The song was originally written by spiritualist and teacher Sri Chinmoy who is credited with a body of works in words, music and art that staggers the imagination. The free flowing tune sets the physical free to roam in the endless possibilities of the spirit. This probably is the best song on the album for its poignancy and sense of pure bliss. Chinmoy's teaching of divine surrender does not go unheeded. The final track is called Humility. The guitar is somewhat more insistent in its lead and the flute also plays a large part in a tune that considers man's worthiness. There is a polyphonous marriage of sound that was not as reverent as I thought it could be, but more of a mild celebration. Still the joyous tune of Eastern and Western influences was pleasantly satiating. If ever there was an album that invited introspection, Sacred Love is the one. The album as a whole was a pleasing blend of acoustics and a harmonious mixture of philosophies. And there is the overwhelming sense of the spiritual love. Shambhu is a first rate song writer and guitarist, and perhaps an even better dreamer.